Pebeo Mediums offer the artist unlimited creative possibilities. The technical and plastic qualities of each medium let the artist create new materials, mix new textures, modify brilliance, alter transparency and build collages. Mediums are highly transparent, non-yellowing, and can be mixed with acrylic colors, inks, and other mediums, or diluted with water. They are waterproof after drying, display excellent flexibility and film softness, and adhere to most non-greasy bases. Black Mica Mortar — Made from a mixture of acrylic polymer and black micaceous iron oxide, this mortar achieves the effect of metallic material. It can be worked equally well with a knife or a brush. Satin Varnish — Non-yellowing, with a tight, supple, indelible finish. Use this varnish for a satin finish, the perfect intermediate between gloss and matte. 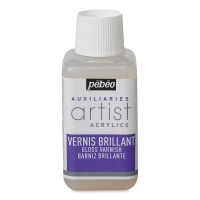 Solvent Based UV Absorbent Varnish — Particularly recommended for the protection of artwork exhibited outdoors, this waterproof varnish gives a satin appearance that filters ultraviolet rays. When dry, the varnish can be removed with petroleum or white spirit without altering the acrylic color. Shake before use. Gloss Varnish — Remarkably transparent, and protective, this varnish creates a strong, flexible, and indelible film that results in an even gloss. 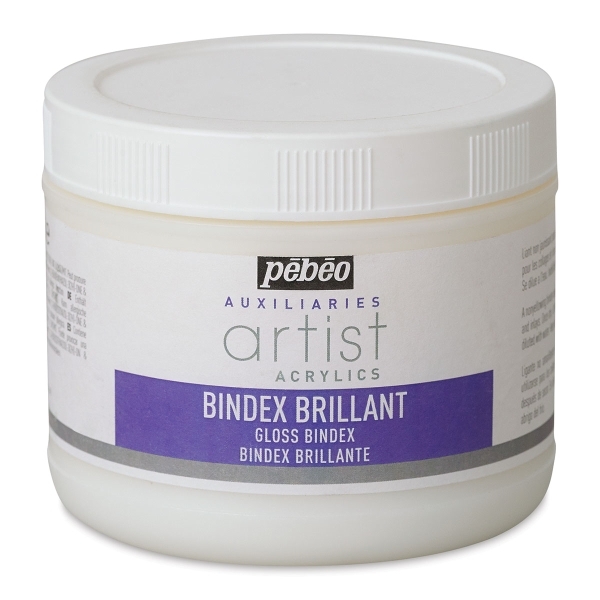 Gloss Bindex — The professional's acrylic binder of choice for collages and inlay works of all kinds. Bindex is non-yellowing, translucent, and waterproof when dry, enhancing your projects with a flexible, satin film. Mix it with colors for added depth and brightness. Sand Mortar — This mortar has a thick and granular consistency resulting from an acrylic and silica polymer base, achieving the effects of granular matter. When tinted with color, it gives a beautiful effect to broken tones. It can be mixed with Bindex. Dries to a semi-matte finish. Matte Varnish — This opalescent varnish creates a protective, strong, flexible and indelible film that dries to a matte finish. Modeling Paste — This opaque paste has a heavy texture for creating reliefs and coatings. Mix it with acrylic color in the moist state and it retains imprints and volume. It dries to a matte finish, does not crack, and can be sculpted and rubbed down when dry. Matte Medium — This translucent medium brings a degree of mattness that reduces color density. It can be mixed with a gloss medium for a satin finish. Shake before use. Gloss Medium — Transparent after drying, this medium enhances the effect and depth of colors. It dries to a glossy finish recommended for making glazes. Structure Gel (Heavy Gel) — When this high-density gel is added to a color, it restores mellowness and allows the artist to work with a great deal of thickness. It is opalescent and extends the drying time of colors. Mix with color up to 50% for more economical painting. 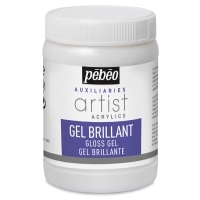 Gloss Gel — With a consistency similar to that of Pebeo's Extra Fine Acrylics, this gel can be mixed with colors to increase transparency and depth. It supports all collages and inlays, and is bright and transparent after drying.